Sibuya Game Reserve is home to the Big Five and is ideally situated in the malaria-free Eastern Cape province of South Africa. Sibuya Game Reserve is situated on 3000 hectares of wilderness in the Eastern Cape, South Africa. This malaria-free game reserve is home to the Big Five and is located close to Kenton-on-Sea situated along South Africa's Sunshine Coast. 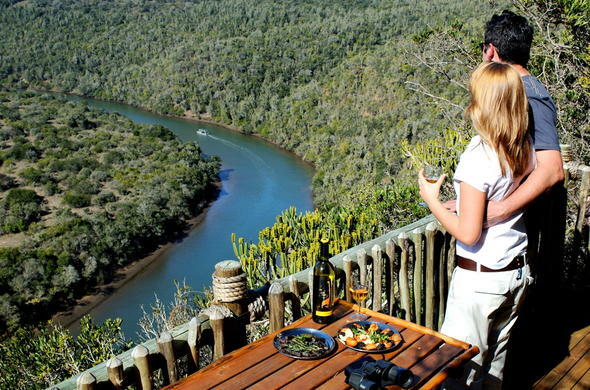 This Eastern Cape safari lodge comprises of two permanent tented camps and a bush lodge. Sibuya Game Reserve provides guests with a range of activities to choose from. The lush subtropical valleys, grasslands and bushveld is home to a diverse range of African wildlife. Explore the game reserve on game drives and guided walks. Some of the African wildlife guests can expect to see during a game drive include the rare Oribi and Bontebok, Rhino, Elephant, Buffalo and Giraffe. The area is home to over 400 species of colourful birds including the rare Narina Trogon.